GALION — If you spoke to most any veterinarian, they would tell you spring is often referred to as kitten season … and for good reason. Many stray and feral cats often show up in homes or get taken to shelters or the local humane society after emerging from the winter cold and having a litter of kittens. For the Thomas family of Galion, helping a stray kitten has taken on a whole new level of commitment. When a female black and white cat showed up in January, Loretta Thomas and her children — Dusty, Nicole, and Jacob — couldn’t turn her away in the cold and snow. They kept her fed and warm against the outside elements, but soon noticed that she appeared to be pregnant. She most definitely was, and finally delivered a litter of four kittens last Thursday. At first, everything appeared to be going well, as anyone would expect. Momma kitty was attending to her kittens by cuddling, cleaning, and nursing them just fine. But after three days, the situation changed drastically. The Thomas family discovered two of the kittens had died, followed soon after by a third kitten. With one kitten remaining, they investigated and determined that the mother cat, who they assume is young herself, never got a milk supply to be able to feed the kittens once they were born. And the kittens were starving to death. Loretta immediately went to the store for kitten milk and began feeding the last remaining kitten with a medicine dropper on Sunday evening. Now, nearly one week after the kitten was born, its survival has become the central focus of the Thomas family. Lots of cuddling and feeding the cat Jacob named Adam every two hours around the clock to keep them all busy helping out. Loretta, whose job allows for her to work from home at times, has even taken the little one to her office with her in order to keep up with feedings. And while she isn’t able to help feeding her last remaining little one, Momma kitty is right there to provide cuddle time with her kitten as much as possible. Jacob, 10, the youngest of the Thomas children, came up with a big name for the tiny kitten. 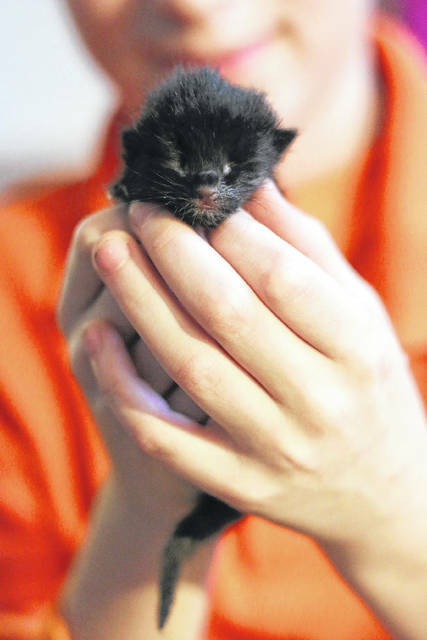 Erin Miller | Galion Inquirer Jacob Thomas, 10, holds up a one-week old kitten he has named Adam. Jacob and his family — mother Loretta and sisters Dusty and Nicole — are working around the clock to hand feed the kitten, whose mother was unable to provide milk herself. https://www.galioninquirer.com/wp-content/uploads/sites/38/2018/04/web1_IMG_9759.jpgErin Miller | Galion Inquirer Jacob Thomas, 10, holds up a one-week old kitten he has named Adam. Jacob and his family — mother Loretta and sisters Dusty and Nicole — are working around the clock to hand feed the kitten, whose mother was unable to provide milk herself.